Barlows Agri become McConnel main dealers for Cheshire. We are pleased to announce that we are now McConnel main dealers offering the full range of McConnel quality products. 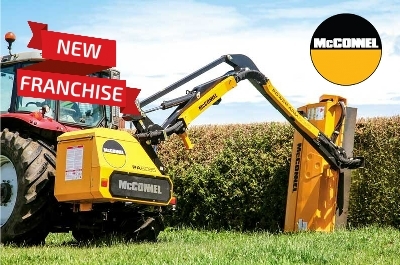 McConnel offers the most comprehensive range of Power Arms, rotary and flail mowers and cultivation machinery in the business with more than 100 different models and thousands of different build options, they have been leading the way with tractor mounted hedgecutters since the 1940’s. Power Arms: 12 different series and 42 distinct models make up the most comprehensive range on the market. Rotary and Flail Mowers: Precision-engineered flail and rotary mowers with a total of 39 different machines available from compact and manoeuvrable 1.3m models to huge high-performance 8.2m flex-wing mowers. Arable Machinery: McConnel is now offering Twose’s market-leading ranges of rollers as well as their own Agribuggy A280 Self-Propelled Sprayer, Seedaerator, Rakaerator, Shakaerator, Discaerator, Vibratilth, Front Presses and Subsoilers. Grassland Machinery: McConnel’s expanded range of grassland machines also features the range of innovative new models developed by Twose and includes Grassland Shakaerator, Fruitaerator, Grassland Subsoilers, Ballast Rollers, Pasturator and Spring Tine Harrows. Material Handling: McConnel is proud to offer a diverse range of material handling products including Bale Handlers, Cutter Grabs, Yard Scrapers, Transport Boxes and Quick Hitches. For more information on any of the McConnel range of products, contact our sales team of visit the McConnel website. The new McConnel Agribuggy A280 is a high-performance self-propelled crop sprayer that delivers a greater power to weight ratio and fuel economy than any of its rivals. A unique low ground pressure design and mechanical drive technology enables operators to go where other sprayers can’t – working in wet conditions and tough terrain and allowing safe, productive working earlier and later in the year than rivals. With a tyre pressure of just 8psi, the Agribuggy enables operators to tackle jobs when other sprayers have to stay at home – opening up new opportunities and giving owners a crucial edge over rivals!